One year and one bad relationship later, his disbelief in insta-love is stripped away the day he meets Six: a girl with a strange name and an even stranger personality. Daniel soon realizes the way he pretended to feel about Cinderella and the way he really feels about Six may not be so different after all. Summary Spoiler Alert: Highlight the text below if you want to read the last two sentences of the summary, which I believe spoil the story. Especially when the two loves of his life end up being one in the same. In general, I'm not a big fan of novellas. I'm always left wanting more: more depth, more character growth, and a more intense conflict resolution. However, I can say with no reservations that I'm a fan of Colleen Hoover's novellas. 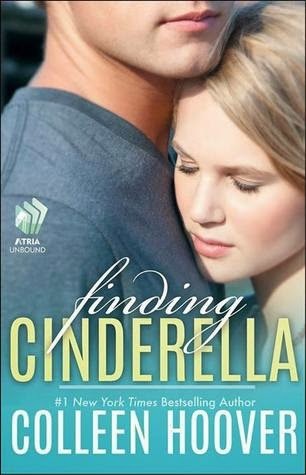 Finding Cinderella was an awesome read, and such a great part of the Hopeless series. It's been quite some time since I read Hopeless, but I immediately remembered Six, Sky's spunky, sassy best friend. Six has a promiscuous reputation, but the reader doesn't know any details about how she obtained her reputation. Until now! I don't remember Holder's best friend, Daniel, as well as I do Six, just that he's a bit of a player and a big flirt. Finding Cinderella starts with Daniel hiding out in a maintenance closet during school. One day, a girl walks in, in the dark. The two don't know each other's names, what they look like, or anything about the other, except for the sound of each other's voice. This fact alone lends their meetings an air of seductive intimacy. And that intimacy is exactly what happens for one hour when they decide to pretend to be in love. That one hour has an life-altering impact on both Daniel and Cinderella's lives. Neither one can forget the other, for different reasons. I loved that Daniel was the narrator for Finding Cinderella. It made me really fall for him, and I loved knowing exactly how he felt about Cinderella. I also liked being in the dark (pun intended) as to who Cinderella was---I was just as excited as he was when he finally found her. Finding Cinderella was an emotional, moving, and passionate story. It's the perfect addition to the Hopeless series, although you don't need to have read either of the Hopeless books to enjoy this short story. I highly recommend it, along with the rest of Colleen Hoover's books!